The Only All Digital, CUSTOM Prosthetic Lens with WaveFront-Optics. 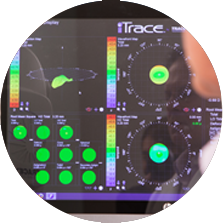 The first step in designing a custom scleral lens involves making accurate digital scans of the shape of the eye. The human eye is unique and has a distinct surface topology for each patient. Generic lenses can never be an adequate substitute for a specialized lens custom fabricated for an individual eye. Each lens needs to match the shape of the eye and fit comfortably for the duration. The LASERFIT® scleral lens rests on the sclera (the white part of the eye). This ensures that the lens remains non-rotational which is imperative for the placement of our custom optics that remedies visual aberrations. The eye is very soft and malleable, sensitive to distortion. The slightest physical touch will change the natural shape of the eye. Therefore great care and technique must be used when scanning. 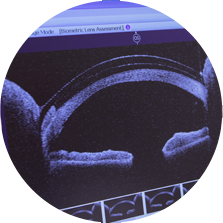 At LASERFIT®, we use a specialized laser to scan the anterior shape of each eye. 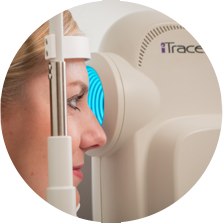 Our scanning process uses an FDA-approved device called an Optical Coherence Tomographer which safely images using an infrared laser. This 3D scanning process is safe, 100% digital and non-invasive. Your scanned data is then imported into sophisticated 3D modelling software and a composite model is created. 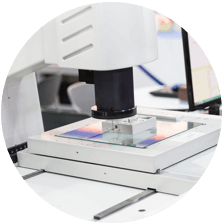 Due to the accuracy of our scanning method, lens optics can be centered on line of sight instead of the corneal apex. We can also easily identify important anatomical markers such as the limbus. This lens template is then used to create a customized LASERFIT® scleral lens design that will result in a near-perfect fit. Then there is the issue of optics. Many manufacturers suggest that small amounts of astigmatism not be corrected. This is because of the lens stabilization issues and the need for heavy and thick truncated prism ballast to keep the lens from rotating. Given that stability is such an issue, it is no wonder that more complex optics are simply unavailable. And that is a pity because many, if not most patients who need scleral lenses have complex optical issues. Even when the acuity is relatively good, they will experience things such as ghosting of images, smearing of images, large glare around lights, etc. These are the sorts of things known as higher order aberrations. People with certain eye diseases such as keratoconus experience lots of higher order aberrations. The presence of these can only be addressed by using something called wavefront technology. When ground into the scleral lens surface, the wavefront-guided optics act to more or less cancel out those higher order aberrations resulting in better vision in most cases. Custom optics, such as wavefront-guided, can be created using a proprietary process and imported into the software as part of the lens design. Once all of the pieces are assembled, another program reads the lens surfaces and exports them to a file to be sent to the lathe for manufacturing using FDA-approved materials at an FDA-approved manufacturing facility. The lenses are actually manufactured at the nearby Truform Optics for same day delivery. The finished lenses can be counted on as being a nearly perfect fit. Of course, in the real world not every variable can be measured, and so some tweaking of the lens fit or optics may be required. However, the result is possibly the best fitting lens with the best possible vision.